Tito’s Tacos is a truly old-school place serving up tacos of the crunchy variety, since 1959 according to the Tito’s website. It’s a taco time machine. The crunchy “gringo-style” taco familiar to us all thanks to Taco Bell is not really in the scope of the cincuenta taquerías project, yet no survey of Los Angeles taco stands would be complete without mention of this popular landmark stand, an atavistic throwback to another part of the evolutionary family tree of the taco. Tito’s is a remarkably polarizing element in the Los Angeles taco dialogue, a lightning rod for both overstated praise and vitriol. A perusal of the remarkable 1241 reviews on Yelp! will display an equal measure of 5-star and 1-star votes. The thoughtful taco eater, however, will find a middle path. While it’s clearly nuts to claim that their tacos are “the best” as so many Yelpers have done, the haters tend to criticize Tito’s not on its own terms but rather for the typology it belongs to, that of the crunchy shell, shredded beef, shredded lettuce, and shredded cheese. This typology may never achieve the heights of the more refined and subtle taco of the Righteous variety, but it certainly has some charms, and Tito’s does it pretty well. Carmen and I rode our bikes there for lunch on this pleasant Halloween day, and ordered three tacos each. 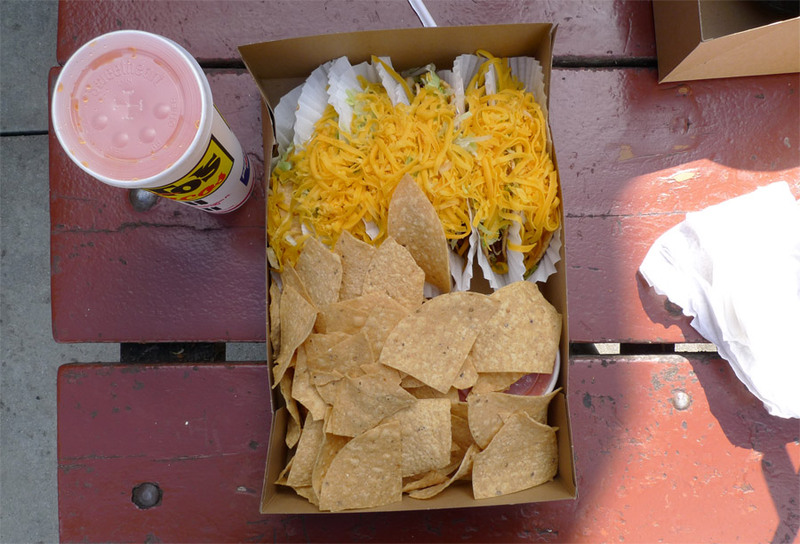 Tacos are $1.75 each, and it is vital to request they come with cheese, which is an extra $.50 each. If you consume more than three, you may prefer to lie down in the gutter after eating rather than ride home. The Tito’s ordering system is unusual. Each window is served by two or three servers, and whoever is next available will take your order when you get to the front of the line. You must memorize the appearance of your server at the risk of facing embarrassment. When the server has gathered your tacos, he or she writes the total on the top of the cardboard box in which your food is served, and then collects your money and takes it to a cashier. 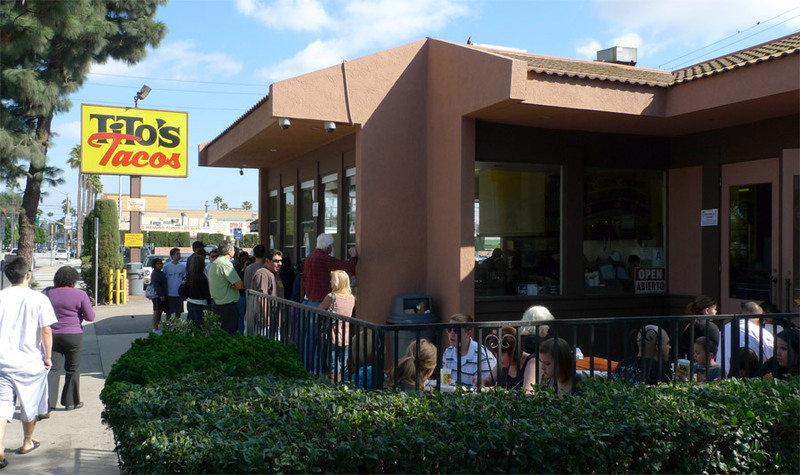 The system is similar to that at Philippe’s French Dips. The menu board is a masterpiece of Late-Modern graphic design, a true design snack. The cardboard box is accompanied by chips, way more chips than you want; and a giant tub of the wicked O.G. Tito’s salsa, a watery tomato puree that I don’t like much at all, but which some customers adore. The meat filling does not resemble the small roundish chunks that commonly make up ground beef, nor the stringy fibers of ostensible muscle that compose shredded beef; rather it’s a dense mesh of fine protein fibers, unique among tacos, with some tooth resistance that makes it more rewarding than the soft-serve sludge that fills a Jack in the Box taco. It is moist without being watery; and it tastes like meat, in the most generic sense of the concept of flesheating, with little seasoning added. The meat is folded into a tortilla, these placed into baskets, and consequently fried in a bath of oil; after the frying, lettuce and then bright, shreddy, cheesy cheese are stuffed into the aperture. One can sometimes get a craving for such a taco, although it’s obviously been at least a year since I answered such a craving. I was looking forward to Tito’s. Their tacos are utterly consistent. I took a bite and enjoyed the contrast between the deep thick crunch of the shell and the rewarding moist yield of the filling; the lettuce probably serves some valuable purpose, although I don’t know what, and the cheese is like a fat- and salt-flavored taco lubricant that makes the thing go down easy. I was satisfied eating at Tito’s. Only hours later, after I looked close up at this photo of the Tito’s taco in section, did I start to think that Tito’s tacos are pretty gross.